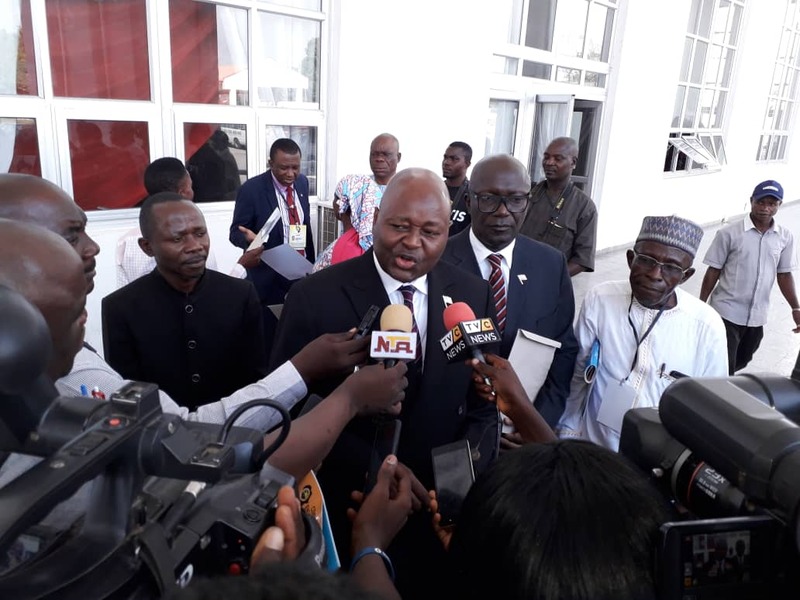 Minna, Nigeria – Liberia’s Ambassador to Nigeria, His Excellency Professor Al-Hassan Conteh has lauded Nigeria and Liberia’s good democratic tenets. A release from the Liberian Embassy in Nigeria recalls smooth transitions in Liberia and Nigeria’s respective recently held electoral processes which strongly demonstrate both countries’ good democratic tenets. According to the release, the Liberian Envoy made the assertions when he served as the keynote speaker of the 9th Annual Conference of the Center for Peace and Environmental Justice (CEPEJ), a renowned non-governmental organization based in Nigeria. The conference was held recently at the Honorable Justice Idris legbo Kutigi International Conference Center in Minna, the Capital of Niger State. Ambassador Conteh lectured on the theme; “Good Governance and Security: Panacea for Sustainable Development in Africa.” The conference was well attended by foreign dignitaries, and Nigeria’s top-ranking military personalities, traditional rulers, and other high profile government officials. “For the first time, an incumbent President (of Nigeria) conceded defeat to his opponent even before the results were announced….The nation watched as many Governors and members of the National Assembly who lost elections willingly conceded to their opponents. For the first time, Nigeria’s elections almost turned out to be a celebration of brotherhood and sisterhood in what can at best be described as the burgeoning of our nascent democracy”, the release quotes Ambassador Conteh as stating. He then chronicled Liberia’s similar path three years later prior to its 2017 Elections as 20 of the country’s 22 political parties copied Nigeria’s example and signed the ‘Farmington River Declaration”. The historic June 2017 ‘Farmington River Declaration’ focused on the holding of peaceful elections and judicial resolution of election disputes in Liberia. Ambassador Conteh stressed that for good governance and security to serve as panaceas for development in Africa, democratic governance must be scrupulously implemented by putting people at the center of development efforts, and aligning development aspirations with Internationally Agreed Goals, including the Sustainable Development Goals (SDGs). Ambassador Conteh however lamented that democratic governance is on the decline throughout the world “partly due to the rise of nationalism and populism in some advance democracies, and the emergence of powerful non-state actors challenging the authority of the traditional structures of the state”. He then named some recently recorded setbacks to democratic governance in Africa to include the challenges with the electoral events in Guinea Bissau, Guinea, Burundi, Egypt and Tunisia, and the civil conflicts in South Sudan and Central African Republic. “Nevertheless, many African countries, including Nigeria have accomplished free, fair and peaceful multi-party elections. As many as 40 of the 54 African states have conducted regular multiparty elections and are at various stages in the development of competitive politics and democratic governance”, he stressed. For his part, the Coordinator of CEPEJ, Comrade Sheriff Mulade, in a welcome address said the aim of the conference was to sensitize Africans, specifically Nigerians on the importance of promoting peaceful coexistence in every aspect of engagement. “The choice of Minna for this year’s conference, as host, was informed by the peaceful atmosphere prevalent in the state. CEPEJ seeks to complement this effort by hosting this conference here in Minna as a show of solidarity with the State,” he inspired. The Director-General, National Orientation Agency (NOA), Dr. Garba Abari, commended CEPEJ for complementing the role of government, the release concludes.